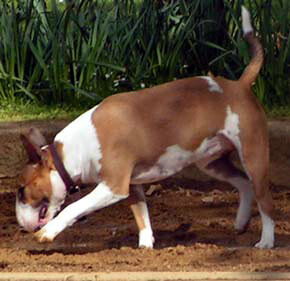 Bull Terriers are known as friendly and outgoing dogs, even having a "clownish" attitude about them. Their physical strength is matched by their intelligence, and both body and mind need to be kept active. They can be obstinate or stubborn and are not ideal dogs for the first-time owner. As a breed they are generally placid and will not normally make the first move. They are very affectionate dogs that love human company. Bull Terriers are particularly good with children.